The student body is divided into four teams at each grade level, and each team has taken the survey these first few days of school. Each team’s survey provides a snapshot for a group of students and their attitude towards reading. The results are contradictory. Take for example the results on 8th grade team in student responses to two prompts: I think being a good reader is important for success in life juxtaposed with the results from I read everyday and look forward to my reading time. Yes, students agree that reading is important, but the data shows they do not feel that the practice is important enough to do every day. Moreover, most students do not think reading if pleasurable with over 50% voting they “rarely” look forward to reading. This results from these questions were repeated throughout the grades 7 & 8, team by team. To counter this, teachers at the middle school are implementing an ambitious independent reading program- 20 minutes a day in a block period- where students are encouraged to read whatever they want from classroom libraries. There are no quizzes. There are no tests. There are no worksheets. The students will have time built into their day to read, but most important, the students get to choose what they want to read. They can choose from the school book collections or bring in their own book. They will talk about their books with each other, and teachers will visit and conference with them to listen about the books they choose. In fighting the toxic effects of “readicide”, teachers already have the data that gives them an ace up their collective sleeves…most students have admitted that reading is important for success in life. Guaranteeing that success will be the goal of the 7th and 8th grade teachers who will be working this year to change that high percentage of students who are “rarely” looking forward to reading to a higher percentage of students who “usually” looking forward to reading. 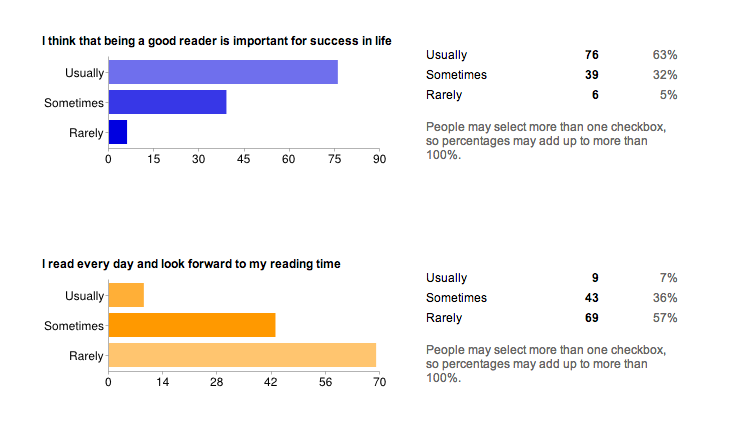 Hopefully, teachers can add an “always looking forward to reading” survey choice as well. The paradox of summer reading: Read=pleasure or Read=work. All students should read at least one book this summer and practice the independent reading skills they have used the whole school year. They should receive credit for reading over the summer, but to give credit means an assessment. An assessment comes dangerously close to committing Readicide,(n): The systematic killing of the love of reading, often exacerbated by the inane, mind-numbing practices found in schools. Anecdotally, 50% of students will read for fun. The other 50% will skim or Sparknote to complete an assignment, or they will not read at all for a variety of reasons: “it’s boring”, “too much work”, “I hate to read.” Many students avoid books creating a “reading-free zone” from June through August. In addition, there are some parents who openly complain that assignments over the summer interfere with family vacation plans. But there are many parents who understand the importance of reading. They could be frustrated all summer as they responsibly hound their children to do their summer assignments rather than wait until the last minute. Summer reading is fun for some, but summer reading is a hassle for others. Why bother, indeed? Well, research clearly demonstrates that summer reading is important in maintaining reading skills at every grade level. A meta-analysis (1996) of 39 separate studies about the effects of summer on student learning came to the conclusion that summer reading was critical to stopping the “summer slide”. 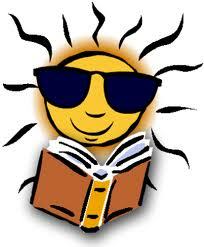 Without summer reading, there could be a loss equaling about one month on each grade-level equivalent scale. Students would be playing a cognitive “catch-up” through November each school year.  At best, students showed little or no academic growth over the summer. At worst, students lost one to three months of learning.  Summer learning loss was somewhat greater in math than reading.  Summer learning loss was greatest in math computation and spelling.  For disadvantaged students, reading scores were disproportionately affected and the achievement gap between rich and poor widened. One summer, we tried an assigned book route. We used a multiple choice quiz to measure student comprehension. The results were average to below average. Most students hated having to read an assigned book. One summer, we tried the dialectical journal kept by a student on either an independent book choice or an assigned book (see post). The results were mixed with 25% students not completing the journal or completing the journal so poorly that we were chasing students for work past the due date and well into the end of the first quarter. One summer, we tried the “project of your choice” in response to a “book of your choice”, but then we were buried in a pile of projects, with a wide variable in the quality of these projects. So, this summer (2013) we are again trying something different in the hopes of finding a better measurement for summer reading. We are giving students their choice in reading fiction or non-fiction. The incoming 7th and 8th graders choose a book for the summer, and the school will provide that book. Students who will be entering grades 9 -11, may checkout a book from an extensive list organized by our school media specialist or any other book they choose. How does the main character change from the beginning of the story to the end? What do you think causes the change? How did the plot develop and why? How did the main character change? What words or actions showed this change? If this book was intended to teach the reader something, did it succeeded? Was something learned from reading this book, if so what? If not, why did the book fail as a teaching tool?Was there a specific passage that had left an impression, good or bad? Share the passage and its effect on the reader. This assessment will be given the second week in September, and while there is a concern that writing is not as effective in measuring a student’s reading comprehension, at minimum this assessment will give the English Department members a chance to teach a writing prompt response. Students who are in honors level or Advanced Placement courses will still have required reading. For example, incoming 9th grade honor students will read The Alchemist and The Book Thief while 12th grade Advanced Placement English Literature Students will be given the choice to read three of the following five titles: Bel Canto, The Story of Edgar Sawtelle, The Poisonwood Bible, Little Bee, or A Thousand Splendid Suns. Before students leave for the summer, we plan on putting books into as many hands as possible. We will encourage students to organize themselves with book buddies, a suggestion from a post by Christopher Lehman, having them organize who they will be reading alongside, someone who they could talk with about their reading. The students have Shelfari accounts and can communicate online during the summer. We will promote our own reading book sites and include an audiobook site SYNC that pairs a young adult novel with a classic each week during the summer. For example, August 1 – 7, 2013 will feature Death Cloud by Andrew Lane, read by Dan Weyman (Macmillan Audio) with The Adventures of Sherlock Holmes by Arthur Conan Doyle, read by Ralph Cosham (Blackstone Audio). We will post information about summer reading on our websites, and send out Remind 101 notices. While the research clearly demonstrates that summer reading is important, how students accomplish summer reading assignments during vacation time is a paradox. Should we assess reading for pleasure, or should students be left on their own and possibly lose reading skills? Quiz them in September or lose them to the summer slide? No right answer, but good evidence to continue the tradition of summer reading. I started this blog for two reasons. The first was a response to Kelly Gallagher’s Readicide, a book I have mentioned numerous times in posts on this blog. I was determined to increase reading in the classroom per his suggestion through “book floods,” and I began purchasing used books for the classroom libraries at Wamogo High School (Region 6 in CT). Fortunately for me, in the Fairfield and Litchfield counties in Connecticut there are numerous sources for excellent quality used books available for $1.00 (or less) through public library book sales held generally in the summer and Goodwill or other thrift stores. I wanted to share how I had added entire class sets of books ( for example: The Curious Incident of the Dog in the Night-Time, The Kite Runner, The Bluest Eye, A Walk in the Woods) or increased books in classroom libraries for independent choice reading in grades 7-12. The second reason was that this past year I required students to write using blogs. At each grade level (9-12), the Wamogo English Department teachers used blogs in the classroom in order to increase student reading and writing collaboration. Our Lord of the Flies unit included “survival activities” on team blogs for 10 graders. The freshmen classes used a blog in different ways: to record individual book reports and to respond to questions associated with whole class reads.. The journalism class’s newspaper format is a blog, and we have also had students blog responses to Hamlet or record their progress on Capstone projects. If I was requiring that students blog, I needed to know how to blog as well. I researched the use of blogs in the classroom. According to Trey Martindale and David A Wiley, in their paper Using Weblogs in Scholarship and Teaching, “Clearly two keys to effective blogging are knowing who one’s audience is, and knowing that that audience is in fact reading one’s blog. My students were motivated and willing to write regularly and with clarity, knowing that fellow students and the instructor were reading the blogs.” I recognized that most student writing is read by the teacher, so our students needed to understand how to target an larger audience. I emphasized this question for my students by having them identify the audiences of other blogs, and then consider the question “Who am I writing this blog for?” and “Who will be able to read this post?”. Similarly, I had to apply the same consideration for this blog. I found the same to be true for this blog, Used Books in Class. 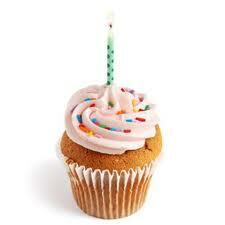 My first post (7/3/11) received 8 hits! I was surprised anyone would be interested in this blog about used books, but those first hits motivated me. Now, after a year, the focus of the blog has shifted from “used books” in class to posts discussing “how books are used” in class. I have drifted into other areas of education, namely the English Language Arts Common Core State Standards, but these issues directly or indirectly impact teaching in the classroom. 26,518 hits later, I still am still surprised at the interest this blog has received. Honestly, it’s not like readers could use yet one more education blog; there is some serious competition for attention! Because to blog is to teach yourself what you think. I had no idea how true that statement would be for me this year. Blogging has allowed me to frame an evolving philosophy of education, and I had to think about my own teaching practice every time I sat down to write. Blogging has provided the platform for me to articulate my responses to issues in education, and I had to think about how public my response would be every time I sat down to write. Blogging has let me practice my writing voice, and I had to think about how this voice needed to attract the reader and keep the reader reading every time I sat down to write. In summation, blogging has taught me over the course of this year how to think in order to write about education. Thank you for reading posts on this blog. I am heading into year two with this “toddler”. When I started, I wondered if I would have enough topics to write about. I do not worry about that any more because this blog has taught me how to write what I think, and I am thinking all the time. I think, therefore I blog. The inclusion of independent student choice texts with the time made available for SSR meant a reduction in the number of whole class reads; four texts remained in the curriculum: Romeo and Juliet, Of Mice and Men, Speak, and selections from The Odyssey. Classroom libraries were augmented with high interest texts (used books in class) with support from the school library and Overdrive software to allow for a wide selection by students. So, what were the results? At the beginning of the school year, students took a survey based on questions suggested in Kelly Gallagher’s Readicide. This week, (June 2012) the same students retook the same survey. In order to account for percentage differences in attendance and enrollments, results were also checked using a t-test calculator to determine statistical significance. While there was only little change in students viewing reading as “fun” or “easy,” 57% to 59% or a 2% increase in the affirmative, the other data gathered from the survey indicates a positive shift in the attitude of our students towards themselves as better readers coupled with an increase in time spent reading outside of class. According to our September survey, 39% of our students rated themselves as “good” readers, 42% rated themselves as “average” readers, and 21% rated themselves as “poor” readers. The difference in June was very statistically significant (t-test) with 66% of students rating themselves as good readers; 30% of students rating themselves as average readers, and only 8% of students rating themselves as poor readers. Responding to the prompt “I read independently every day and look forward to my reading time” in September; 9% of students responded “usually”, 35 % of students responded “sometimes”, and 56% of students responded “rarely”. However, by June, the difference in student attitudes her was also very statistically significant (t-test) with 19% of students responding “usually” (up 10%), 53% of students responding “sometimes” (up 21%), and 33% responding “rarely” (down 23%). Finally, not only did the SSR program did increase the number of books read by students for class, students indicated (very statistically significant) that they increased the number of additional independent books they read over the course of the year. Students reading no addditional books dropped from 32% to 11% while students reading 1-2 books increased from 52% to 58%, students reading 3-4 books increased from 13% to 22%, and students reading over 4 books increased from 3% to 8%. These numbers complemented the finding of students who increased their overall “not for school reading/reading for pleasure” for 60 minutes or more (5%), for 30-60 minutes (17%) , and for 30 minutes or less (17%). The number of students who admitted to doing no additional reading dropped from 22% to 15%. What the research tells me [about SSR] is that when children or less literate adults start reading for pleasure… good things will happen. Their reading comprehension will improve, and they will find difficult, academic-style texts easier to read. Their writing style will improve, and they will be better able to write prose in a style that is acceptable to schools, business, and the scientific community. Their vocabulary will improve, and their spelling and control of grammar will improve. On more than one occasion, I’ve started class by simply reading aloud. I didn’t explain what I was doing or why, I just started reading. They may be 15 or 17 years old, but they quickly get quiet and listen, trying to understand what is going to happen next, just like youngsters in story hour. They aren’t too old for reading aloud, and they aren’t too old for SSR. Most students are grateful for the time. When I look at changes in modern society, I understand why. So do I. Our students occupy a digitally distracting universe: tweeting, texting, tethered to some instant communication that generates a almost compulsive nervous response. Carving out time, 10-20 minutes a class, for quiet SSR is necessary for students who need to focus when they read. Sadly, this may be the only time during a day when students read. Voluntary reading involves personal choice, reading widely from a variety of sources, and choosing what one reads. Aliterates, people who have the ability toread but choose not to, miss just as much as those who cannot read at all. Individuals read to live life to its fullest, to earn a living, to understand what is going on in the world, and to beneﬁt from the accumulated knowledge of civilization. Even the beneﬁts of democracy, and the capacity to govern ourselves successfully, depend on reading. Our practice of good reading habits, SSR provided twice weekly with student selected texts, can lead to improved attitudes towards reading, and we now have the data to prove that one academic year of SSR has improved our 9th grade student attitudes towards reading. SSR will be included as an important part of our literacy efforts at other grade levels as well. Current efforts to improve our students’ love of reading is allowing them the opportunity to choose what they want to read. Since the amount of time available to teachers in a school year is finite, the inclusion of independent choice reading materials in a curriculum means that some things, usually whole class novels, have to go. In the case of our 9th grade students, the curriculum has been reduced to three whole class reads: Romeo and Juliet, Speak, and Of Mice and Men. The remainder of the year is devoted to student choice, fiction and non-fiction. In other words, I am running a blended reading curriculum of student choice with whole class novels. I am convinced my students need this balanced approached to literacy. gr. 4-12: half the books our students read should be recreational in nature. We don’t want to raise test takers; we want to raise readers. more books = more reading = better reading. nothing happens without books. Dear Common Core, where are recreational reading expectations? While I agree with Allyn that not every book will make a student a lifelong reader, I believe she is clouding the issue of whole class reading with bad teaching of a whole class novel.Yes, it is true that some books are very difficult for reluctant or low level readers, so it is surprising that she suggests a student may choose Graham’s Dove (RL 6.6) given her earlier reference the isolation a low level reader may have with to To Kill a Mockingbird (RL 5.6) Regardless, a low level reader will struggle with a high level text unless there is some instruction or support. And while I agree that her suggestion of more inclusive reading materials (blogs, magazines, non-fiction) is important, I also believe the communal experience that occurs in the reading of a whole class novel is equally important. I am not suggesting the unit that beats a novel to death for week upon week, or what I refer to as the “it takes as long to read The Hobbit as it did Bilbo to get to his confrontation with the dragon, Smaug”. I am promoting the whole class novel experience where students work collaboratively to decode a text, share opinions, make comparisons, or criticize plot points. I promote the whole class novel with support for the low level readers and supplemental activities for the less engaged students. Reading levels should not limit student accessibility to a text when there is support available, for example, an audiobook. Please note: I did not say vocabulary and worksheets are supplemental activities. Ideally, I advocate the whole class novel to capitalize on contexts or issues in other subject areas. 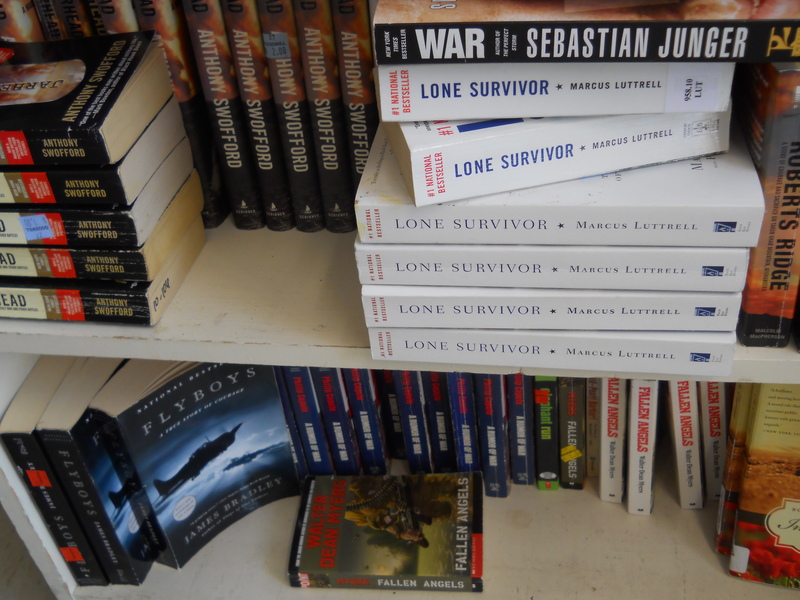 Students can read All Quiet on the Western Front while they are studying World War I in Modern World History classes. Students can read Silent Spring as a companion piece to an enviormental studies course. 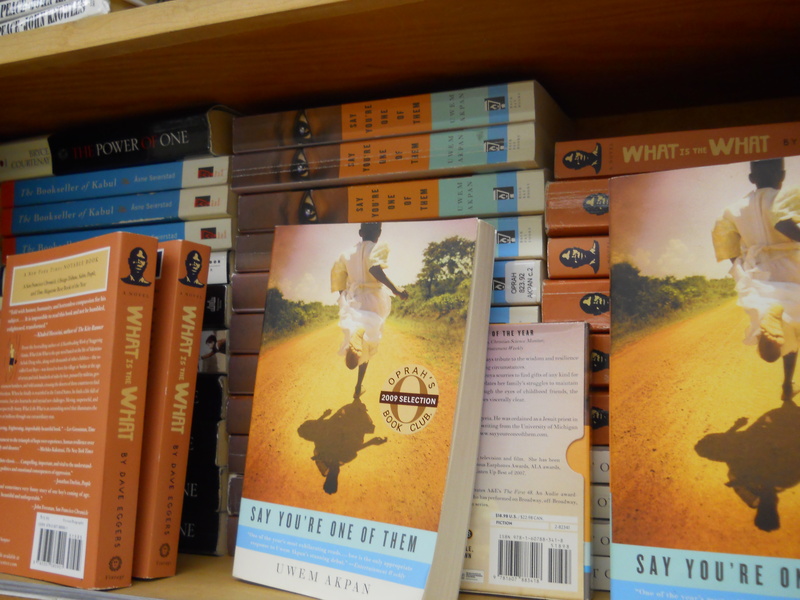 Students can share the stories in Warriors Don’t Cry or Mississippi 1951 when they are studying a Civil Right’s unit. Whenever possible, I advocate a interdisciplinary read as a whole class novel. I see great benefit in asking students to recall the themes, characters, settings or plot points with something they read earlier in their lives, particularly with the more complex texts at the middle or high school level. I will ask about the dystopia of The Giver when we read Brave New World, or the societies represented by animals in Charlotte’s Web when we read Animal Farm. A shared understanding of a previous reading experience with others provides immeasurable insights into a new reading experience. She explains that her immersion into choice only reading resulted in many students selecting reading that did not challenge them. Students chose “fun books”, which she compared to beach reads noting that her students were not reading as closely as she wanted. In other words, “not all reading is the same.” She decided that many students still needed to be taught to read a novel, just the same as students are taught to read a poem or short story. Her solution? Well, first she picks high interest books (The Hunger Games) which students purchase for annotation. Students make notes in the margin, put question marks next to the text they find confusing. In using this approach, “The trick is to get them to be patient with it. This is a different kind of reading and we are reading for a different purpose.” Her point is a good one. Many students may need to be taught to read a more challenging text if all they read is what interests them. I see reading as a community for my students as both academic and social. I need to prepare students for the rigors of college and the real world since there is an expectation of cultural literacy in our society. Students will encounter references to texts that compare relationships to the doomed Romeo and Juliet or the awkward Holden Caufield or the fair-minded Atticus Finch or the the skin-flint Ebenezer Scrooge; they should understand those references. Teaching complex texts that students would not select independently ensures they can be included in conversations that extend beyond the classroom. Teaching a whole class novel can be successful if, like any subject matter, students can be engaged. Language arts teachers need to seek a balance in in allowing for student choice while still teaching students how to read a challenging text. Every wave of innovation in teaching such as the recent calls for independent choice has an opposite one, such as traditional whole class novel instruction. Maintaining balance with these waves is what makes education successful. 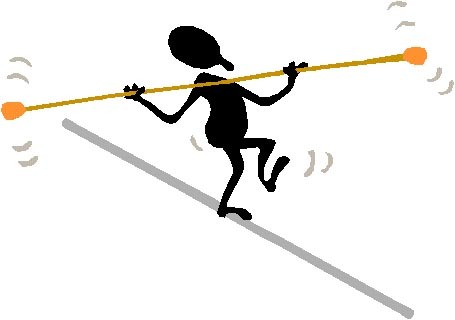 Balance means emotional stability; calmness of mind; harmony in the parts of a whole. Providing for independent choice plus whole class reading equals a balanced student. Classrooms are several feet deep in a “book flood” at the Wamogo Middle and High School. While there has been a torrent of late summer rains that have closed roads and delayed schools in the Northwest corner of Connecticut, our students are experiencing a deluge of an entirely different nature. 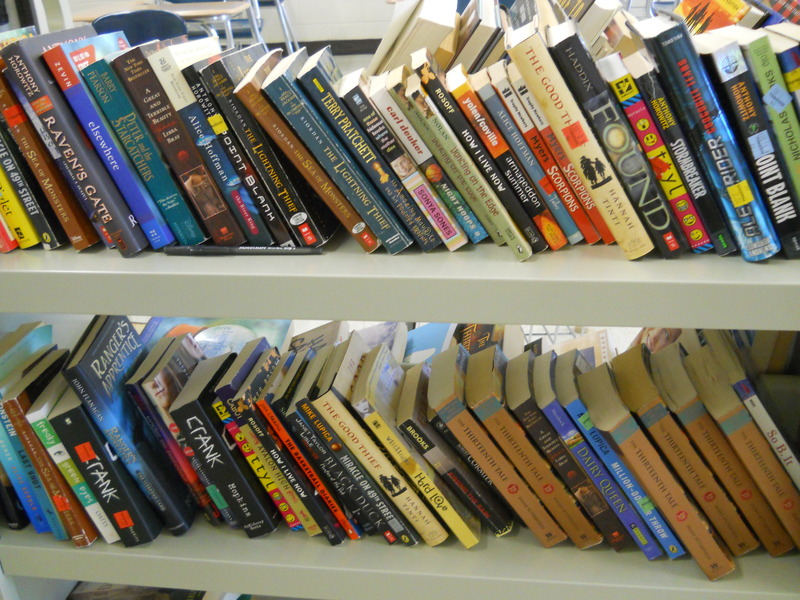 Gently used books spill over in classroom bookcases; they slop on to counters and swamp several double-sided carts. The term “book flood” is used by Kelly Gallagher in Readicide. 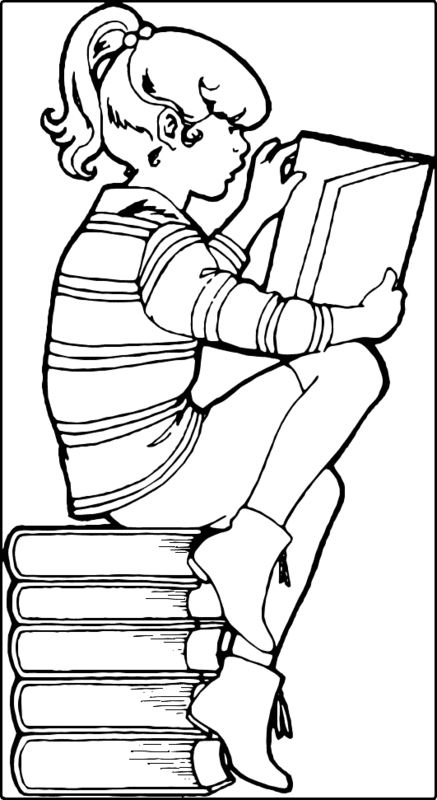 He states, “Let me be clear: if we are to have any chance of developing a reading habit in our students, they must be immersed in a K­12 ‘book flood’–a term coined by researcher Warwick Elley (1991)” (43). Book flood is a theory, recently tested in countries (Fiji, Sri Lanka, Singapore) where English is not part of the culture. The theory is that students exposed to quantities of literature will learn English as a second language more effectively. Gallagher suggests that American educators do the same in their classrooms by asking, “Do students at your school have access to a wide range of interesting reading materials? Is providing access to interesting text a priority among your administration and faculty? Are students on your campus immersed in a book flood? Are we giving them every opportunity, via reading, to build vital knowledge capital?” (49). 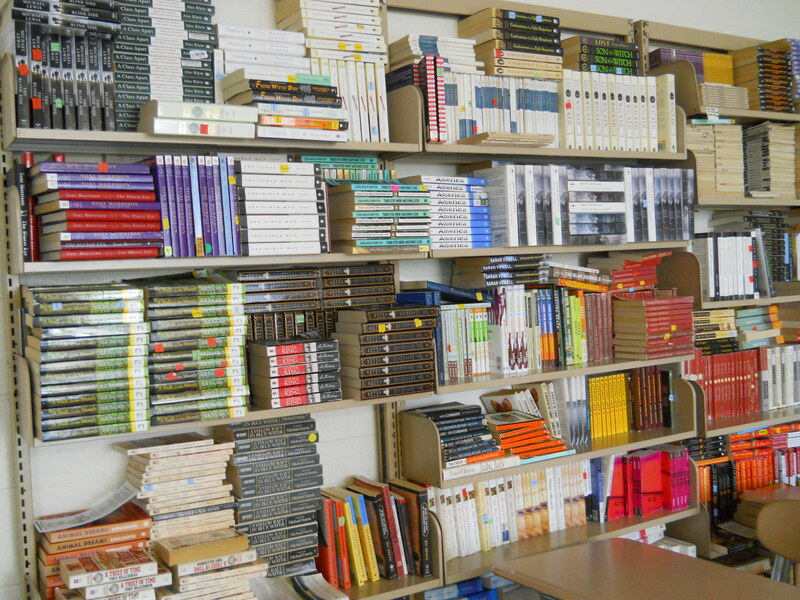 Over the course of one year (June 2010-2011), the Wamogo English Department had added 2,500 books previously used books to the classroom collections. Many of these books are familiar titles that are taught in grades 9-12 (EX: The Great Gatsby, Lord of the Flies, Animal Farm, Speak, The Glass Castle, A Lesson before Dying, The Bean Trees, To Kill a Mockingbird, The Handmaid’s Tale) or titles taught in grades 7 & 8 (EX: Stargirl, Nothing but the Truth, The Giver, The Light in the Forest, The Outsiders, No More Dead Dogs). Additionally, class sets of books (20 -30 copies) that were already purchased as new books were expanded with used copies for each student at grade level. For example, the 10th grade library started with 20 copies of The Kite Runner. After two years, there are now 116 copies for 10th graders, one for every student, plus all teachers and teachers’ aides. There are also 15 copies of A Thousand Splendid Suns for students who would like to read another novel by Khaled Hossani. Similarly, 20 copies of Mark Haddon’s The Curious Incident of the Dog in the Night-Time were purchased new in 2009. An additional 67 used copies have been added since; 13 more copies will make a grade level set of 100 copies. 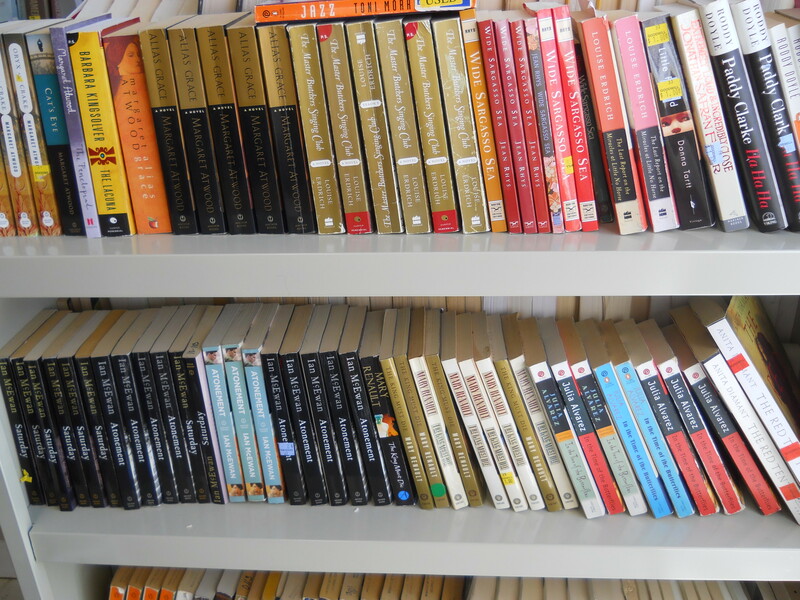 In order to offer independent choices for the Advanced Placement English Literature and English Language classes, newer titles have been added including multiple copies (4-30) of The Plot Against America, Alias Grace, The Adventures of Kavalier and Clay, Middlesex, The Story of Edgar Sawtelle, The Poisonwood Bible, In Cold Blood, Love in the Time of Cholera, Paddy Clarke Ha-Ha, Dinner at the Homesick Restaurant, The Elegance of the Hedgehog, Cold Mountain, Ironweed, The Wide Sargasso Sea, Gertrude and Claudius, Atonement, The Hours, and The Memory Keeper’s Daughter. There are thematically connected texts for 10th grade World Literature such as a unit centered on adolescents growing up in conflict. These books include A Long Way Gone, The Power of One, What is the What, and First They Killed My Father. Students can choose to read one of these titles in literature circles. There are also thematically connected texts for non-fiction (A Walk in the Woods, Into the Wild, The Perfect Storm, Touching the Void, The Hungry Ocean, Between a Rock and a Hard Place) and fiction (The Bluest Eye, Their Eyes Were Watching God, The Color Purple, Invisible Man, The Known World, Monster, Precious, Native Son) for students in English III American literature to read independently or in groups. But, it is in the area of providing book choice for independent reading that the largest gains have been made in the classroom collections. There are book series (Percy Jackson and the Olympians, The Ranger’s Apprentice, Maximum Ride) available for 9th students to choose during Silent Sustained Reading (SSR) sessions. There are many different titles from popular teen authors: Meg Cabot, Anthony Horowitz, Jodi Picoult, Sarah Dessen and Scott Westerfield. There are several (5-10) copies of books such as The Lovely Bones, Dairy Queen, So Be It, Where the Heart Is, and The Thirteenth Tale. There are pairs of books such as The Chosen, The Good Thief, Bad Kitty, Shadow of the Wind, Sleeping Freshmen Don’t Lie, Prom, and Life As We Knew It. There are single copies of The London Eye Mystery, The Off Season, The Compound, The Maze Runner, Black Duck, and Copper Sun. At the conclusion of the summer of 2011, after trips to thrift stores and public library book sales throughout Connecticut, another 1,700 copies of books have been added to our shelves at a cost of approximately $2,300.00. The “book flood” straining the banks of Wamogo’s classroom shelves is, as Gallagher suggests, wide-ranging; it is a flood saturated with interesting material to read. Our students are now inundated with titles; our teachers have an overflow of suggestions. We have created the one flood in which I could happily watch students drown. I wonder if the authors of novels, plays, or long poems write with the intent of the reader receiving “full rewards”? What does “full rewards” mean anyway? I assume from the publication The Chronicle of Higher Education that Jacobs is talking about literature of the canon usually taught in at the college or college-prep level. At these levels, does “full rewards” mean the analysis, deconstruction and/or the synthesis of literature? Is the examination of his or her literature the goal of an author? I believe Jacobs cannot qualify what he means by “full rewards” because that quality cannot be standardized. I am also not convinced authors are seeking readers who read for “full rewards”. I think authors are seeking readers-all readers-any readers. Authors write for an audience. There are audiences of middle and high school students who are required to read novels, plays, and long poems. The length and complexity of many of these works (ex: Catcher in the Rye, The Giver, Huckleberry Finn, All Quiet on the Western Front, Great Expectations, Of Mice and Men, The Scarlet Letter, The Odyssey, Death of a Salesman) in a curriculum means that units dedicated to a text can go for several weeks as teachers try to develop the kind of deep attention in their students for the “full rewards” that Jacob admires. For example, Shakespeare’s Macbeth takes a minimum of four weeks to teach. Consequently, by the end of the unit, everyone wants to kill Macbeth: characters, students and teacher alike. Yet, in those four weeks of intense study, students still will have not received the “full rewards” of the play according to Jacobs; they will have only grazed the surface of the tragedy in the “small chunks and crumbs” afforded by the school day calendar. Honestly, Shakespeare must roll in his grave over the plodding of innumerable classes trudging endlessly “To-morrow, and to-morrow, and to-morrow, Creeps in this petty pace from day to day…”. Was “full rewards” Shakespeare’s intent? The goal of education should be to develop reading skills so that students should read successfully. Once students read successfully, measured by understanding the author’s message and appreciating the author’s style, then students may choose to read what they like, perhaps even what they love. Teachers, myself included, tend to “over-teach” literature. Kelly Gallagher discusses the “over-teaching” of texts in his book Readicide, and poses the following question, “When you curl up with a book, do you do so with the idea of state mandated multiple choice tests? Do you pause at the end of every chapter so you can spend an hour answering a worksheet with mind-numbing answers?” He continues that adult readers would “never buy a book at Barnes and Noble if it came with mandated chapter by chapter exams….And we [adults] would never feel compelled to read if we [adults] had to complete a project after every book.” Gallagher maintains that these are the practices that are killing the love of reading; so, it is no wonder Jacobs can make the statement that the love of reading has been the pursuit of a limited number of adults. I will concede that Jacobs does have a point, the “deep attention” that leads to his meaning of “full rewards” may be impossible to implement in a typical middle school/high school setting, but I would also venture that authors are not as concerned with “full rewards” as they are with communicating a message to an audience. By week two of Macbeth, most, if not all, students recognize that Macbeth has brought about his own tragic fall, that his wife is riddled with guilt, and the kingdom they have usurped cannot last. Shakespeare’s enduring legacy is his ability to communicate to a universal audience; “full rewards” may not necessary for students to appreciate the play, although “full rewards” could be an individual pursuit of a student who makes that choice. Alan Jacobs’ theory of wringing the “full rewards” from a text is the reason middle school and high school students cannot be taught to love reading. Such teaching is fragmented and frustratingly slow for the teacher and student in school. Jacobs also recognizes that the love of reading has always been built on the choice of the reader; he discusses his own progress as an adult to develop his deep attention to reading. In contrast, Kelly Gallagher offers strategies to limit “over-teaching” and provide student choice earlier at the middle and high school level that may allow students to develop a love of reading on their own much earlier rather than later to develop “deep attention” to reading as adults. Love of reading should not be an out-of-school experience. But first, let me address the title. The “We” in the title could mean many different stakeholders: parents, teachers, administrators, education policy makers, academics. For the purposes of this response, however, I will generalize “We” to mean the teachers in the classrooms; those “boots on the ground” educators. We can’t teach students to love reading does not mean that we cannot teach students to read, or to read better, or to appreciate what they read. I would argue that no one can teach anyone to love something or someone; love is a choice of the heart or the mind. As a high school English teacher, I confront readers and non-readers every day in the classroom. Most students do not read with “serious deep attention.” I also appreciate how difficult deep reading is for my students given the hyperactive environments of school and the hyper-connected environments after school: digital devices are distracting; sports are demanding; jobs may be necessary. However, reading is the skill that is paramount in education. So, I believe schools must carve out time for reading. I believe that teachers and administrators need to set aside time for reading in all disciplines. I believe adjustments must be made to schedules in order to provide quiet time for students to read, and for teachers to demonstrate how one can read deeply in such environments. Once students have developed the skills to read and acquired a positive attitude towards reading through practice, they may choose to read out-of-school. They may read for fun. The National Assessment of Educational Progress (NAEP) found that “students who read for fun almost every day outside of school scored higher on NAEP assessment of reading achievement than children who read for fun only once or twice a month,” and much higher than students who did not read for fun at all. At the middle school and high school levels, we can offer students a choice of contemporary coming of age novels when they are assigned JD Salinger’s Catcher in the Rye. We can offer students a chance to read real life adventures when they are assigned Homer’s The Odyssey. Or, we can simply let students pick a book they want to read. These combination of factors can help improve student reading. There are many factors which lead Jacobs to his conclusion, “All this is to say that the idea that many teachers hold today, that one of the purposes of education is to teach students to love reading—or at least to appreciate and enjoy whole books—is largely alien to the history of education.” While Jacobs may be correct about teachers and education’s historical role in contributing to the love of reading, there are teachers today who are promoting choice, providing time, and welcoming new technologies in improving student reading. Perhaps their response to Jacobs could be in an article titled, “We Can Make Students Better Readers Who Have Developed ‘Deep Attention’ By Offering Time and Choice.” Deep reading should not be a minority pursuit. Readicide is defined as, “the systematic killing of the love of reading, often exacerbated by the inane, mind-numbing practices often found in schools.” I fear I was a Readicide practitioner in my early years of teaching, but I am now trying to recover and adopt practices suggested in Kelly Gallagher’s book Readicide. Shouldn’t schools be the places where students interact with interesting books? Shouldn’t the faculty have on-going, laser-like commitment to put good books in our students’ hands? Shouldn’t this be a front-burner issue at all times? I know that the increase of titles I have purchased in the secondary market is a step in the right direction. In two years, English Department members have added over 200 titles to our collection; some in small sets of three copies and other sets with as many as 60 copies. We will continue to teach “core texts”, but we offer independent reading books as well. We organized titles by theme and now let a student choose which book he or she would like to read. We have noted that our students are more enthused -and therefore more likely to finish – when they select a text. 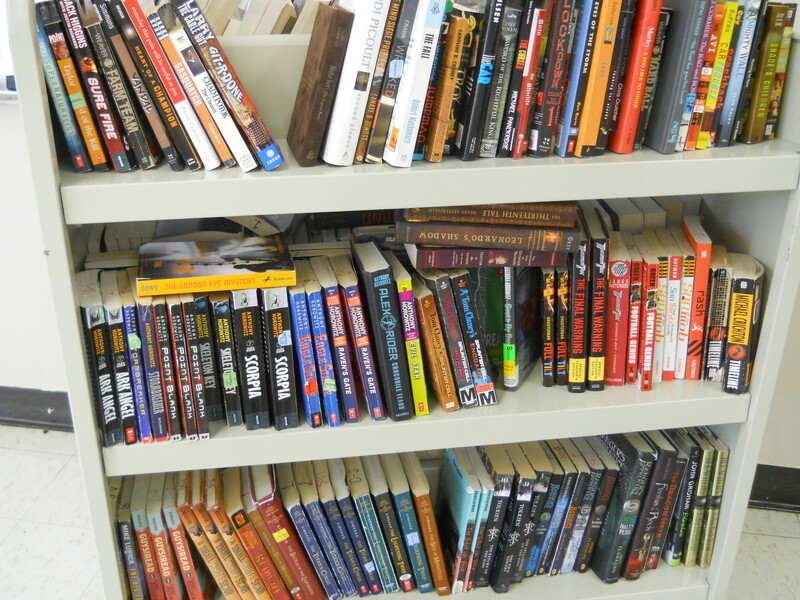 We now organize literature circles around student book choice….and we are offering more and more choice in a cost-effective way by using used books. We are changing how we teach and what we teach in order to stop the practice of readicide. We hope that others will too!